Syracuse is in the heart of New York State, and it offers outstanding attractions, great entertainment, and the best shopping in Central New York. Want somewhere interesting to stop and spend a few hours on your way to other destinations? Are you looking for a unique, visitor-friendly place to spend a few days? In either case, Syracuse fits the bill. Syracuse's hotels and restaurants are sure to please: comfortable, convenient and priced right. 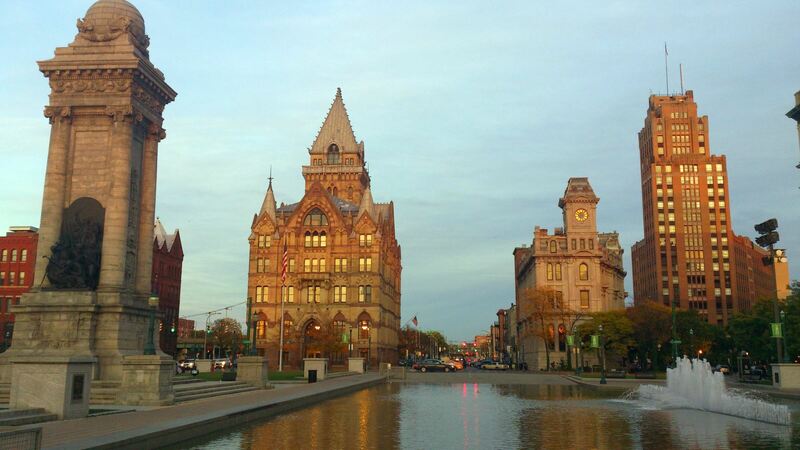 With a city population hovering around 160,000, metropolitan area at 730,000, Syracuse is Upstate New York's third largest city and government seat for Onondaga county. Although it features all the amenities of a major city - including one of the nation's top symphonies, the first domed stadium to be built in the Northeast and the only domed IMAX Theater in New York State - Syracuse has a small-town feeling that makes tourists feel right at home. Syracuse's unique geography means that opportunities for fishing, boating, skiing, snow tubing, golfing and tennis are just minutes from downtown. Clinton Square: the heart of the city and home to the Jazz Fest (the Northeast's largest free jazz festival); Hanover Square: the city's former commercial and entertainment district whose buildings, some of Syracuse's oldest are all on the Historic Register; Columbus Circle: home to one of the nation's finest arts and crafts shows and dominated by a monument to Christopher Columbus carved in Italy; Armory Square: Syracuse's version of SoHo with galleries, boutiques, restaurants, an IMAX theater and nightclubs. THE place for evening entertainment. Shopping & Dining: One of the favorite places to shop is Destiny, a shopping mall at the foot of Onondaga Lake. The mall covers 1.5 million square feet, is seven stories, and offers numerous shopping and entertainment experiences. Local restaurants in the downtown area include the BC Restaurant, Pastabilities, Clinton Square Cafe, Blue Tusk, Kitty Hoynes Irish Pub, Lemon Grass, Opus, L'Adour, The Mission, Francesca's Cucina, Asti Cafe, Atillio's, Ilario's Tratoria and the famous Dinasaur Bar-B-Q. Parks/Lakes/Recreation: Syracuse has parks, fields and recreation areas that fill up more than 1,000 acres. The city has 12 public pools and two public ice rinks. Residents can also enjoy the Oncenter, a downtown convention and entertainment complex which has a sporting arena, theaters and a convention center. There is also plenty of art to be appreciated in Syracuse.There is the 75-member Syracuse Symphony Orchestra as well as many other musical performers. There are museums, art galleries and places to patronize theater and the performing arts. Also, there are two annual outdoor jazz festivals in the city. One aspect of local culture Syracuse may be best known for is its college sports; Syracuse University basketball games are often attended by upwards of 30,000 fans, while its football games reach more than 40,000. Also, right outside the city is Onondaga Lake Park for picnicing, fishing, boating, cycling and jogging. There are 14 golf courses within 7 miles from the center of Syracuse (Bellevue Country Club, Tanner Valley, Burnet (9 hole), Popes Grove (9 hole) Drumlins, Westvale, Tuscarora, Tecumseh (9 hole), Sunnycrest Park (9 hole), Links at Sunset Ridge, LaFayette Hills, Pine Grove, Westhill and Orchard Vali). How is the housing market in Syracuse New York? It is a buyers market in Syracuse. The average home in Syracuse sales price is $98,600, and the average time it takes to sell a home, when priced correctly, is 58 days.